Every town needs committed business, businesses that really care about what the community requires for a happy existence. We like to think healthy and affordable food is as the centre of any good community, and that this applies not only to food stores and restaurants, but also to caterers. Here at Taste the Cracklin, we work hard every day to ensure that the people of Tonbridge and the surrounding areas have a service available to them which can provide their event with the perfect dining experience that suits them. As you might have guessed, our speciality is producing beautifully cooked hog roasts time and time again. We’ve built our reputation on this, and our mouth-wateringly good spit-roasts never fail to please people. But don’t let our name fool you, we aren’t a one trick pony; not only do we roast more meats than pork (including spring lamb, sirloin of beef, whole chickens and turkeys…), we have a fully fledged set of menus, which include all the courses one should expect of a modern day caterer. We’ve worked just as hard on our gourmet canapés, starters, desserts and side dishes as we have on our spit-roasts – it’s all about getting a perfect balance, and we couldn’t achieve that without excellent dishes to compliment our roasts. All this means that we can offer our services for all parties, big or small, ornate or simple. From just renting a machine, to a fully catered event. At Taste the Cracklin versatility is our byword. Unlike other caterers, we don’t impose restrictions on your event. We can cater for very intimate private parties, with only a small number of guests, so forget about caterers being only for big or important events like weddings or corporate events – we’re changing all that. Similarly, our menus are always only there to give you an idea of what we’re capable of, because we’re always open to input from our clients. Got a family recipe you want to see served up to all your guests? Not a problem; our experienced chefs are used to being able to accommodate themselves to what you want. That’s why we have an in-depth discussion with every potential customer, to draw up a plan to your exact specifications – we’re just there to give you ideas if you need them, and take care of it all on the day. 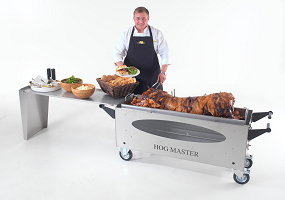 The staff here at Taste the Cracklin Hog Roast in Tonbridge, we can cater for both office and catering, are all of one mind on serving you as best they can. We know that only 100% effort is sufficient to thrive in today’s market, and only 100% effort will do when it comes to what is often someone’s most important day of the year. If we’ve whet your appetite, don’t hesitate to contact us soon – our dedicated staff are just a phone call or email away, and there’s no time like the present for getting your catering sorted!